Leverage the power of Face Analytics in your app! We put consumers’ behavior insights at your fingertips. You can now easily build and infuse AI-based face analysis functionality into any online-enabled app or service, while making customer interaction more human and engaging! Built on top of advanced Computer Vision algorithms, F.A.C.E. is able to detect multiple faces in an image and quickly measure the unique face attributes. Turn insights into business advantage! Emotion-enable your apps to recognize how your customers feel and respond to them effectively. 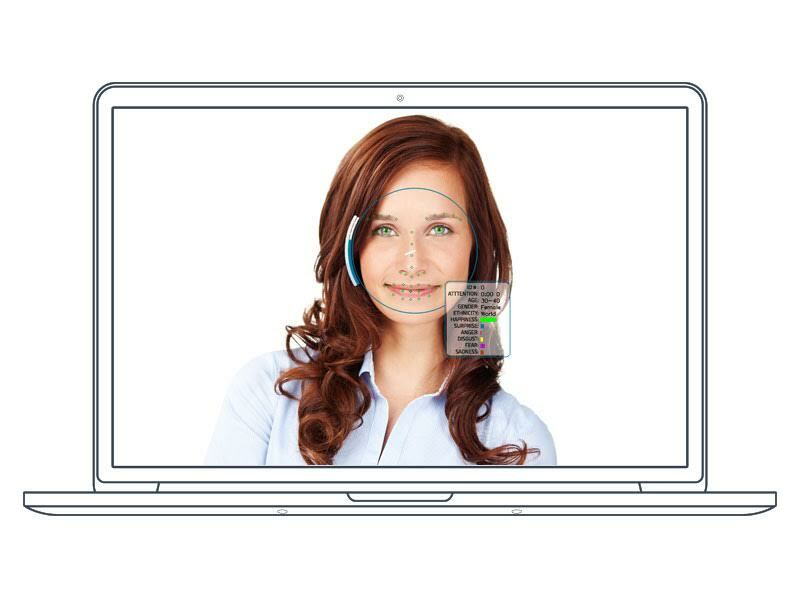 Detect universal facial expressions like happiness, surprise, sadness, disgust, anger and fear. Measure your customers’ age, gender and ethnicity in real-world scenarios. Use these insights to deliver more engaging, targeted experiences and apps that will delight them! Automatically find out which content gets the most interest, by analyzing customers’ head movements. Attention is the new currency, use it to target your marketing efforts and stay relevant! Build your next-gen, human-aware app in any of your favorite desktop and mobile environments (Windows, OS X, Linux, iOS, Android). Yes, we really made it that easy for you! Easily add face analytics into your own apps, with no need to program or use powerful hardware. Process images in the Cloud and get back the face results immediately. Couldn’t get any easier! Wow your customers with the help of unparalleled face analysis. Turn Human Analytics into Valuable Insights, and Insights into Action. Offer relevant and targeted brand experiences based on your customers’ behavior, profiles and liking. Leverage crowd analytics to nurture exceptional, long-lasting customer engagement. Build user-centered apps and services that understand and respond to people. This leads to more effective Marketing decisions, happier and engaged customers, and improved ROI. Turn happy customers into loyal customers, by delivering custom campaigns and creating solid one-to-one relationships that will last. Greater customer loyalty results in greater profits!